When will be Cyborg Soldier 009 next episode air date? Is Cyborg Soldier 009 renewed or cancelled? Where to countdown Cyborg Soldier 009 air dates? Is Cyborg Soldier 009 worth watching? Our story starts out with a youth named Joe Shimamura. One day Joe is captured by a top secret military organization called 'Black Ghost', who is bent on promoting global warfare. Along with Joe, eight other individuals from all over the world, are captured. Each of them, against their will, are transformed into cyborgs. Black Ghost plans to use these new cyborgs as killing machines for war. It's not long after that Joe and the others, and an old scientist , rally together and escape the military base. Black Ghost soon sends out other machines to capture the cyborgs. Fortunately, the heroes are able to use their new abilities and powers to get away safetly. Can they stay out of Black Ghosts clutchs and stop their evil scheme at the same time? 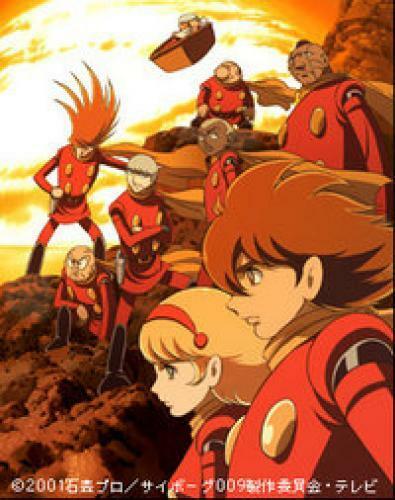 EpisoDate.com is your TV show guide to Countdown Cyborg Soldier 009 Episode Air Dates and to stay in touch with Cyborg Soldier 009 next episode Air Date and your others favorite TV Shows. Add the shows you like to a "Watchlist" and let the site take it from there.